Next up we have a notebook placed firmly in the higher end of the laptop market - manufactured by Toshiba as part of their all encompassing Satellite range is the P875-31P. A 17.3" laptop, offering a pretty extensive specification for it's price tag of around £1200 - an Intel Core i7 - 3630QM 2.4/3.4GHz processor, a 1TB hard drive operating at 5400rpm, as well as a generous 16GB of RAM all running Windows 8. Read on for our Toshiba Satellite P875-31P review. 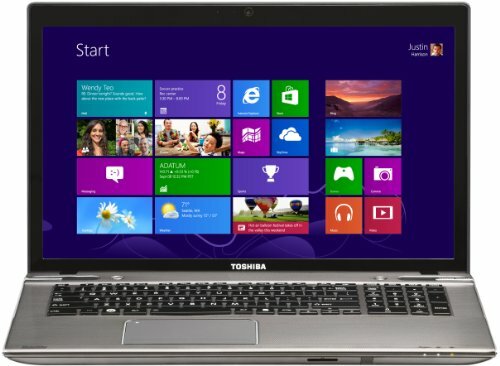 Below is our review of the Toshiba Satellite P875-31P, a 17.3" laptop, featuring 16GB RAM, 1TB hard drive and Windows 8. So, you've got over a thousand pounds to spend on a Windows based laptop and are unsure which option is best for you. The more money you are looking to spend, understandably the more care you'll take in deciding - and as such we will endeavour to provide a fairly conclusive review of this notebook - the Toshiba Satellite P875-31P. This model features a 17.3" screen, and as such is slightly larger than the average laptop - measuring 41.8cm by 27.2cm by between 2.8 and 3.4cm in depth. Weight is 2.99kg - this isn't hugely heavy, but there are lighter options out there - and so this machine may not be the most suitable for commuting and carrying about. However considering the overall price of this laptop, it is unlikely that the majority of users will be looking to travel with this notebook. The 17.3" display operates at a maximum resolution of 2048 pixels by 1536 pixels with a maximum refresh rate of 100Hz. The non-interlaced resolution with maximum refresh rate is 1920 pixels by 1200 pixels, and overall the display gives a very good picture. In terms of external connections Toshiba have provided plenty of options: HDMI, RJ45 Ethernet, headphones 3.5mm jack, a microphone jack, multi card reader supporting the majority of popular formats, VGA, four USB 3.0 ports, as well as a 2.0MP FHD webcam, operating at a resolution of 1920 pixels by 1080 pixels. Finally it also features a built in Blu-ray drive to please the movie buffs. The processor is the Intel Core i7-3630QM - this is a fast quad-core processor used primarily in laptops, and is based upon the Ivy Bridge architecture. The four cores can handle up to eight threads in parallel which provides more effective use of the CPU, due to hyper threading. Each individual core provides a speed of 2.4GHz, but with turbo boost this can be increased up to a maximum of 3.2Ghz (4 active cores) or 3.3Ghz (3 active cores) or finally 3.4Ghz (for 1 active core). This is further backed up by a very generous 16GB of RAM, which when combined makes this laptop very fast indeed. In terms of build quality, we'd be happy with this feature if the laptop cost less. However for the high end price tag, we'd expect a bit higher quality finishing, with more brushed aluminium and less plastic. So overall what did we make of this laptop? And would we recommend it to those looking to spend over a grand? Runs very fast, looks good, extnsive specification means it should last. Build quality isn't up to much, considering the high price tag. A good functional laptop, let down only by the slightly cheap looking materials used. In terms of functionality, it's a good purchase, and works well. Overall we'd say it's solid but slightly uninspiring.